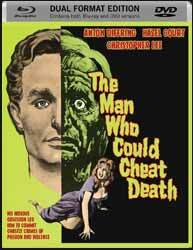 This is an unsung classic from Hammer Productions, which dates back to 1959. Rather than Lee, it is Anton Diffring who plays the protagonist in a role not too dissimilar to the one he played in Circus of Horrors. However, this is an infinitely superior film. Diffring is an unusual choice to play a suave Dorian Gray-like abomination of nature. However, this is not a horror in today’s widely accepted sense; it’s closer to a suspense thriller. In fact, apart from the necessity to kill to survive every ten years, Georges comes across as quite a sympathetic character. He even has the foresight and compassion to withhold his findings from publication because he fully realises how this will reflect on population growth and food shortage. Everyone around him takes the moral high ground, but the question investigated by this simple but effective script is, given Georges’ position, would you have the strength to forego treatment and die if you were given the chance of another ten years healthy life? The Man Who Cheated Death borrows from Jack the Ripper (for the opening scene), the aforementioned The Picture of Dorian Gray (in some ways the sculptures take the place of Oscar Wilde’s picture, as they represent the killed women who have kept him alive), and The Strange Case of Dr Jekyll and Mr Hyde (for the sequences involving the serum which, after the ten years has expired, prevents his reversion to old age over six hour intervals). The scene in which he begins to revert consists of slightly bulging eyes and a sickly pallor like he has the onset of jaundice. So, not much visual horror on display. However, this being a Hammer film, there just has to be a dramatic climax to see-in the closing credits. In this instance we have Georges’ rapid ageing-to-death amidst a raging fire. This could so easily have been mediocre material, but for the tight script by Jimmy Sangster and the clever direction from Terence Fisher – a great team and both mainstays of Hammer. Even Christopher Lee gets a rare opportunity to play against type, in what seems like a dry run for his part in The Devil Rides Out. Extras include an entertaining Interview with critic and author Kim Newman, and an Interview with film scholar Jonathan Rigby. There is also a Limited Edition Collector’s Booklet.